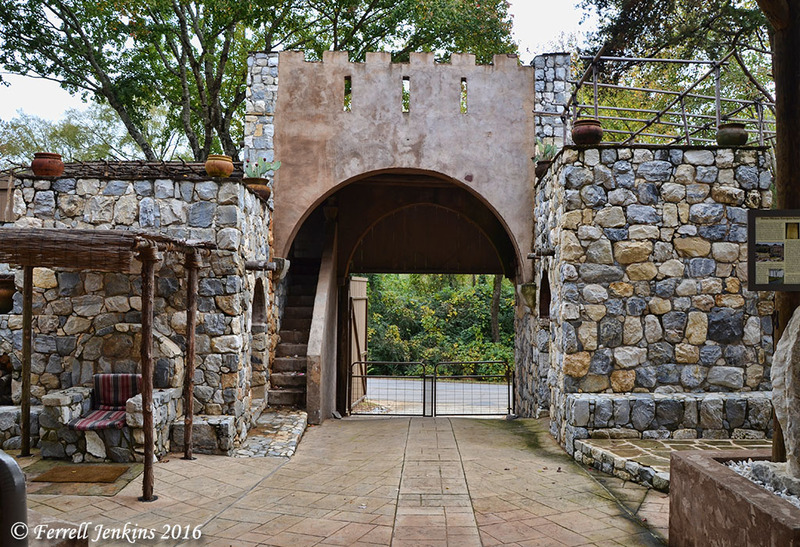 The Explorations in Antiquity Center, in LaGrange, Georgia, now in its tenth year, has changed the name to Biblical History Center. The new website with detailed information is available here. New Logo for the Biblical History Center, LaGrange, Georgia. The Biblical History Center is the brainchild of Dr. James (Jim) Fleming, well-known for his teaching in Israel. Dr. Fleming established Biblical Resources in 1975, for the purpose of producing educational materials and aids for teaching the historical, geographical, and archaeological background of the Bible. It was wonderful to have these resources together at one place in Israel, but it is beneficial to many more to have the resources available in the Southeastern United States. We have mentioned the Center prominently here, here, and here. My wife and I had the opportunity to stop by the Biblical History Center last November. Several significant changes have taken places since our earlier reports. The BHC now has a Biblical Life Artifacts Gallery displaying 250 artifacts from the National Treasures of Israel. Instead of having these items displayed in cases with a sign telling what they are, they are exhibited in life-like settings. 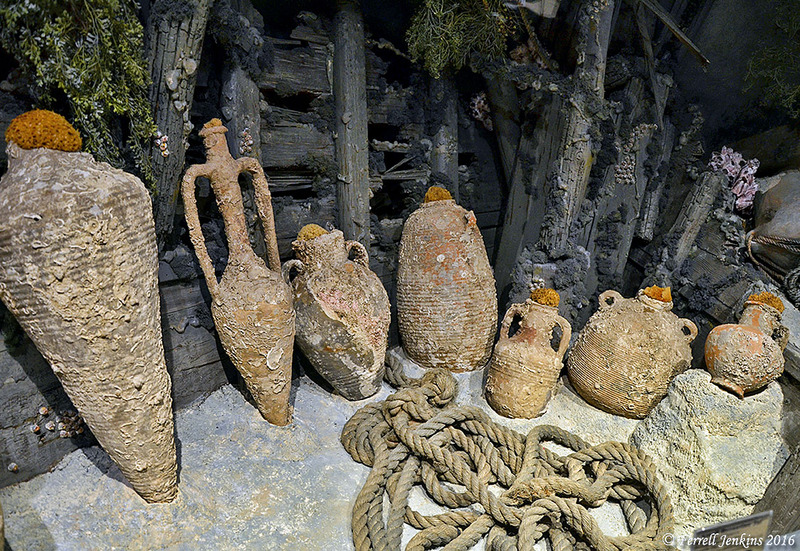 Genuine artifacts from a shipwreck off the coast of Israel displayed in a life-like setting. Photo by Ferrell Jenkins. The new Biblical Life Artifacts Gallery is housed underneath the seating of the Roman theater. 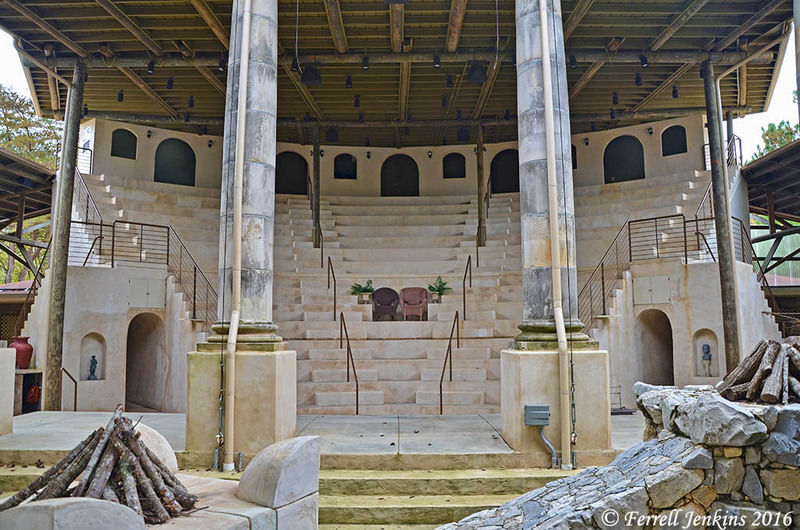 Roman theater at the Biblical History Center. Photo by Ferrell Jenkins. Of course, there are other important things at BHC. The photo below might remind one of the Middle Bronze Age gate at Tel Dan, and the canopy to the left of the gate recalls the Iron Age gate at the same city. This is where the king or judge sat in the gate to receive the people (2 Samuel 19:8). Other features of housing from biblical times are also shown in this structure. The gate at the Biblical History Center. Photo by Ferrell Jenkins. Other artifact pertains to farming, shepherding, fishing, the process of dying and weaving cloth, storage, glass production, coins, foods, games – to name a few. The Biblical History Center is a family place with guided tours. 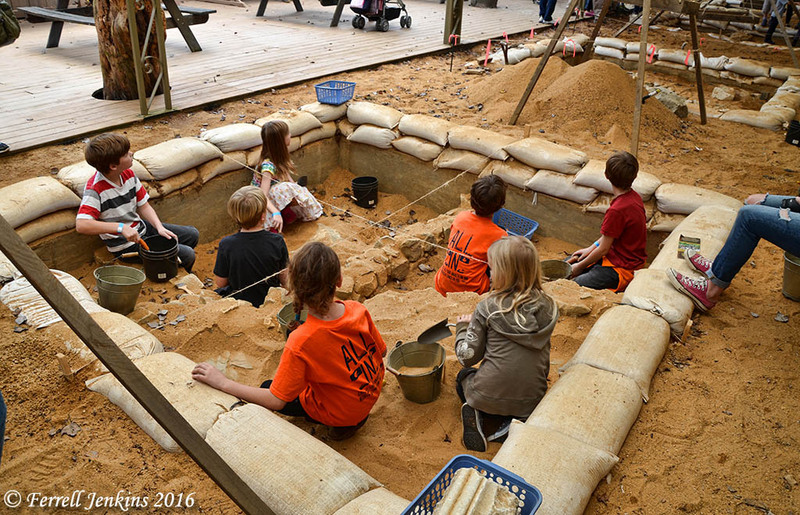 They even have a place where kids can participate in an archaeological dig. And you can arrange for a biblical meal and learn what it means to “recline at table” (Matthew 26:7). Kids learning about archaeology at the Biblical History Center. Check the BHC web site for complete information about the various exhibits and hours of operation. If you live close enough, this is a wonderful place to take an entire Bible class or church group. The teachers of the children’s Bible classes at one church I know about went as a group to learn more about Bible times and customs. Want to see the types of altars mentioned in the Bible? What about crosses or tombs, wine presses or threshing floors? It’s all there. When I walked into the BHC ticket office I handed my card to Mrs. Crenshaw. She said, “You have written about our Center.” I explained that I had recommended the Center because I knew of the work of Dr. Fleming in Israel. I had met him there and at Professional meetings, but had never been to the Center. In the earlier reviews I used photos made by David Padfield and Jane Britnell. She sold me a ticket for my wife and said, “There will be no charge for you.” Later we had an opportunity to speak with Jim Fleming for a few minutes. This is a great facility that I highly recommend. This entry was posted in Archaeology, Bible Lands, Bible Study, Culture, Israel, New Testament, Old Testament, Photography, Travel. Bookmark the permalink. Delighted to learn that my work encouraged you to makes these visits. Thanks for sharing. Thanks. Corrected in the post. I suppose your theory is as good as any. Perhaps it is just old age catching up. Ferrell: Just a heads-up: In the final paragraph, I think you have conflated Jim/Fleming/Jenkins? to get “Dr. Jennings”. BTW, I volunteered with his outfit in Ein Karem in 1999-2000. Visited the place in LaGrange once, in 2011. In the summer of 2013, my son and I went on a “Bible Archaeology” trip in the southeastern United States! Using tips from bro. Jenkins’ blog, we went to the Lynn H Wood Museum at SAU in Collegedale TN and this museum in LaGrange GA. Certainly worth the driving and the few dollars admission.